If you have read some of my older posts, especially the ones relating to latino foods, you see that I occasionally write about recipes that might be a bit disturbing to the general American cook. This is not on purpose but because the experience of cooking food in the US can be fantastically different from that in other countries where the people are much closer to the food source. In the past, I have featured photo-documentaries on how to prepare a pig for a lechona (pig roast) (Electronic Gluttony: A pig roast by any measure), have talked about making liver and onions (Liver and Onions: You might even like it! ), and how to make delicious fried pork belly (chicharrones) (Chicharron – Deep fried pork belly – How To). 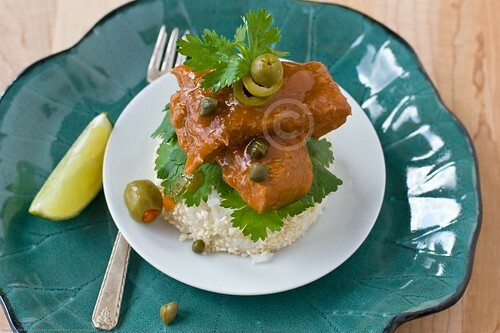 Today I am going to share a recipe that comes out of my childhood and likely that of many other Colombians (as well as other latinos) – Lengua de res en salsa de alcaparras (Beef Tongue in Caper Sauce). Yep, thats right, beef tongue. If you are a real foodie, this should not be that much of a stretch. If you are still learning about new foods and new cultures, do not be afraid, this is not as odd as it may seem. As a kid, I did NOT like this dish. I can not say why but I have a memory of turning my nose up to it and I regret that. I think it had to do with the tomato being cooked and acidic and not about the flavor of the tongue. I had never bought a tongue to make for my family but when I was on a pig belly shopping mission to make Colombian chicharrones recently, I came across a beef tongue and decided to make it myself and see how I did and how my family did. One of my goals for this year is to go deeper with my photography and explore foods more intimately. This beef tongue was just such an opportunity. I hope to share other foods over time, its just a matter of creative space to get to it. What follows is a little slideshow of photos that explore the shapes, textures, and colors of a raw cow’s tongue. If you think this will disturb you, skip it, my goal is not to gross you out. These things do not gross me out because I am curious about everything and I find great beauty in nature. As you might be able to tell and simply know on an intuitive level, a tongue is mostly muscle. There is also some very delicious fat and connective tissue going on there that turns out resplendent when served. If you decide to follow the recipe below (and I recommend it to intrepid cooks) do not hesitate to get your hands dirty. There will be peeling of this and that layer of the tongue to get it to the edible stage. No way around that! Before I share the recipe, I would like to share my outcome. It came out in a way that did not invoke my previous experience. My problem with this recipe previously stemmed from the tomatoes, not the tongue. This recipe does not deliver an acidic tomato experience but, rather, a smooth delicious one. The tongue slices are so tender you can cut them with a plastic spoon, I promise. 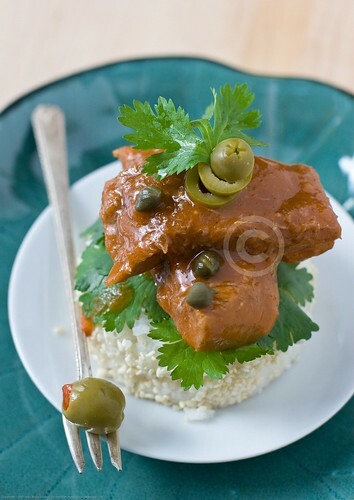 The tomato caper sauce, studded with green olives, is an exact fit against the richness of the tongue. My 11 year old said this when she tasted it, Oh mom, it tastes so savory! Like as if the savory was overwhelmingly good. There must be some massive umami going on here because it is like distilled beef essence, all in a good way. My 4 year old said nothing because she was too busy eating. The 1 year old licked his lips and wanted more. The much older husband was also surprised by how delicious it was. Mind you, the husband and the 11 and 4 year olds, they all watched as I did a whole photo shoot of the raw tongue then proceeded to boil and skin and boil and simmer the thing. There was no chance that anyone could forget that this was a cow’s tongue we were talking about. I had to fight to save a couple of pieces to shoot the next day. Was not a pretty sight and the moment I was done shooting the beauty shots, the sharks moved in and the tongue disappeared! 1. Rub the tongue with the cut lemon halves. Rinse thoroughly under running water. 2. Place the tongue in enough water to cover and simmer for about an hour. (10 minutes in a pressure cooker). Remove from heat and let it stand in the water to let it cool off a little in order to handle it. Remove it from the water and throw the water away. 3. Scrape the skin from the tongue with a knife. 4. Put the tongue with the 5 cups of water back into the empty pot. Add the green onion, garlic, salt and the peppercorns. Bring to boil, then lower temperature to simmer and cook for about 2-3 hours or until tender. (40 to 50 minutes in the pressure cooker). Let it cool off a little. Remove the tongue from the broth and set aside. Bring broth to a boil for about 10 to 20 minutes to reduce. Strain the broth in a colander lined with dampened cheesecloth to remove the solids. Set aside. 5. Add the oil in a large, heavy skillet over high heat. When hot, brown the (un-cut) tongue all over, for about 6 to 8 minutes. Remove and set aside. 6. In a food processor, add the 2 coarsely chopped onions, the tomatoes, and the flattened garlic cloves. Finely process. Add this mixture to the skillet. Also add the reduced broth, tomato paste, wine, salt, and ground pepper. 7. Bring to a simmer for 5-7 minutes. Add the tongue, capers and the chopped olives. Cover, over medium heat, and cook for about 30 minutes, or until the sauce is thickened. Place the tongue on a cutting board and thinly slice. Place the slices back into the sauce, or place the slices on a serving plate and pour sauce over it. Liver and Onions: You might even like it! It looks like a wonderful dish. We love beef tongue and also get buffalo tongue from our friend who has a bison ranch. Can’t wait to try the recipe. Tongue is not a stretch for me but I did stretch my mind recently in Santa Barbara, CA, eating eyeball, lip, and cheek tacos at Lilly’s Taqueria. They were excellent. Without knowledge of their origin, it would be difficult to know what parts the meat came from. They both appeared as shredded, dark, moist meat in tortillas. With salsa, onions, and cilantro on top, they made my Christmas Eve lunch quite memorable. thanks for posting this recipe! My husband’s family is Colombian and my father in law introduced me to tongue in tomato sauce. I am looking forward to trying this recipe. I just took two beef tongues out of my freezer! I would love to have some more of your recipes – exotic and traditional are both welcomed. Thank you for offering. mi esposa es Espania y una muy buena cocinera. Yo, como intentar gabacho … y quieren probar esta receta. Me criÃ© en la cabeza de queso, etc, pero como para tratar otros temas. I love it. The only thing I did differently is that I cooked the tongue in my slow cooker until it was tender as you said. Also, instead of frying the whole tongue, I fried the slices. Am I writing in English? PerdÃ³n. Se me olvidÃ³ que estamos en un sitio en espaÃ±ol. Bueno, de todos modos, deliciosa. My mother is from Hamburg, Germany. She remembers her mother making tongue with caper sauce. We were looking on line and found your site. We did not use a tomato base, rather used the natural aju augmented with bullion then added it to a butter, flour roux. My husband and I served this recipe for our dinner last sunday. The whole family liked it, I most certainly will be cooking it on a regular basis now, it is really lovely to discover original suggestions for tasty recipes and easy to understand methods to fix them. Thanks for giving some. Awesome! Thanks for posting this, I am trying to store up recipes for “offal” (does tongue count as offal). I feel like it is better to try more parts of the animal.